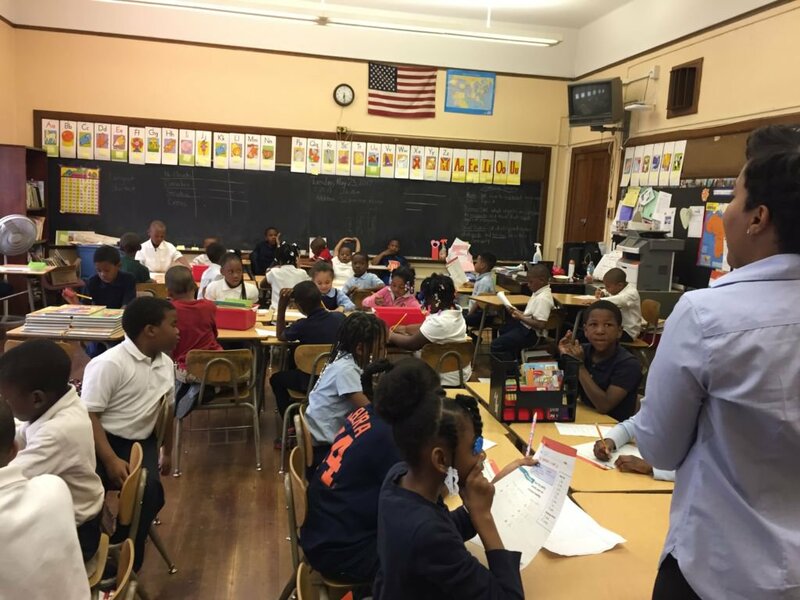 Detroit schools have been buzzing these last two weeks with what feels like a fresh start. A new superintendent — Nikolai Vitti — has landed in the city and started his job as the first new leader of what is officially a new district. He uses words like “transformation” and “vision” and “hope” to describe a future when Detroit schools will begin to address the intensive challenges that have contributed to some of the lowest test scores in the nation. He sees Detroit becoming “a mecca of improvement” that will draw young teachers from around the country who will want to be part of a city’s metamorphosis. But spend a morning in a Detroit classroom and it quickly becomes clear exactly how much will have to change in this city before it looks anything like the “mecca” that Vitti imagines. 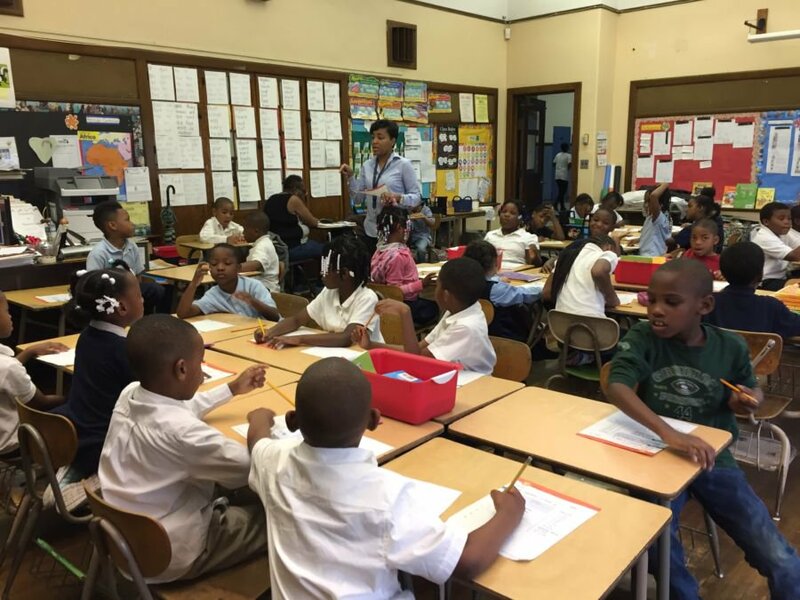 Spend a morning in Room 106 at the Paul Robeson Malcolm X Academy on the city’s west side. That’s the room where first-grade teacher Rynell Sturkey arrived on the morning of May 23rd — Vitti’s first full day on the job — to discover that another teacher was out on jury duty. Since substitute teachers are rarely available, Sturkey would — again — have to double up. That morning, she’d have 37 kids. A teaching shortage has prevented the school from hiring for non-academic classes such as music, art and gym. So Sturkey and her students will be crowded together in their cluttered classroom for seven hours, with only a break for lunch and recess. She and her colleagues get none of the prep periods that are standard for teachers in schools with more resources. RELATED: Dear teacher: We want to hire you. Here’s a huge pay cut. Sincerely, unions. In addition to the crowded conditions, Sturkey says her curriculum didn’t arrive until March. Her kids are tested on computers they don’t know how to use and key supports such as social workers and counselors are hard to come by. Sturkey has heard Vitti’s hopeful message, she said, but teachers in this city have heard a lot promises over the years and have seen the painful effects of disappointment on the city and its most vulnerable children. 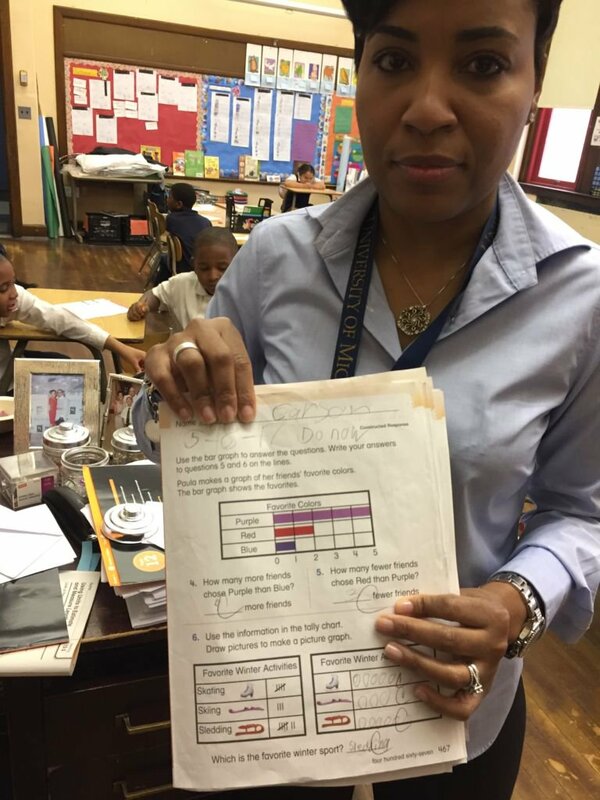 Rynell Sturkey, a first-grade teacher at the Paul Robeson Malcolm X Academy on Detroit’s west side, said she didn’t get the workbooks she’s required to use to teach math until March this year. “I’m keeping an open mind,” said Sturkey, a 17-year veteran of the Detroit district who grew up in the city and attended its schools. “I have to. I care about this city. I care about these kids." On the morning of May 23, Sturkey started her day moving desks around to accommodate an additional class of 20 kids. Soon, it would be difficult to walk between the packed-in desks. Some were jammed against the blackboard, others clustered near the door. When storytime arrived, Sturkey had to lean against a wall to read to her students instead of sitting on the floor as she prefers. Sturkey read loudly and clearly to be heard over the tapping pencils, squeaking chairs and shuffling feet of more than three dozen 6- and 7-year-olds. Some kids listened to the story. Others, unable to see the pictures in the book, gazed out the window. One boy had his head down on his desk, apparently asleep. The noise level in the class is a direct result of a district-wide teacher shortage. Across the city last month, more than 200 teaching positions were unfilled, including two at Robeson. 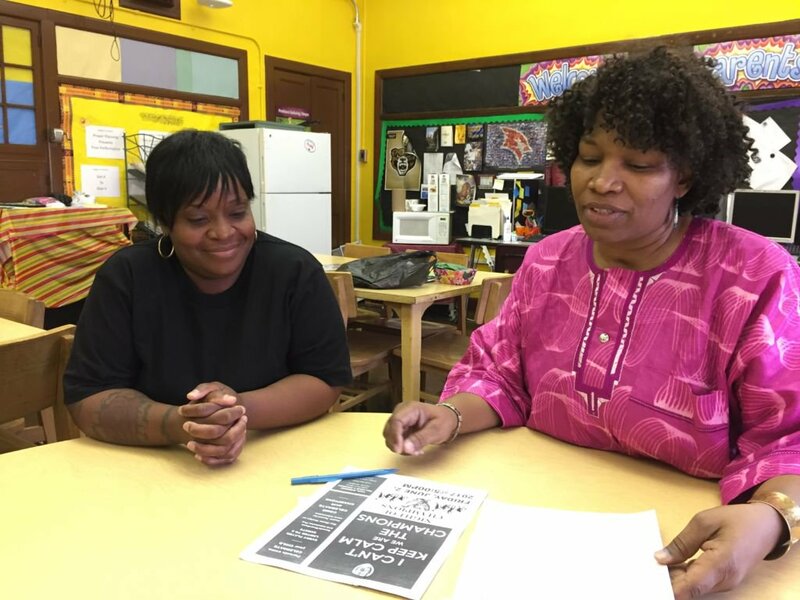 Parent leaders Aliya Moore, left, and Stephanie Beal have organized protests at the Paul Robeson Malcolm X Academy to protest a teacher shortage that has left kids without needed instruction. Principal Jeffrey Robinson says his openings are not a priority because they’re not in core subjects like reading or math. And low salaries make hiring difficult. First-year teachers earn $35,683 a year in Detroit according to the current contract with the city teachers union. Many suburban districts pay thousands of dollars more. “On three separate occasions, we got people who got past the onboarding process, right to the point where they were ready to sign the contract. Then they took a better offer because the salaries are just not competitive,” Robinson said. The absence of those teachers is compounded by the lack of substitutes, he said. When the school’s seventh-grade teacher was out for an eight-week medical leave this year, the district sent a substitute for only one day, Robinson said. Help didn’t arrive until the seventh-grade teacher returned last month from her leave. The doubling up in Sturkey’s classroom, which happens roughly three or four days a month, she said, is one way the teachers at Robeson make do. It’s difficult, she said, but not as difficult as last year when she had 38 students enrolled in her classroom every day. Working with too many kids is only one of the challenges Sturkey has faced this year. Another was a math curriculum that didn’t arrive until March. The textbook arrived on time, she said. But the workbooks that are a key part of the district’s math program were missing through the fall and winter. “They just kept saying it was coming,” she said. But months passed without anything arriving. The lack of materials have affected her students’ performance on the tracking tests the district requires her students to take, she said. But the fact that the tests are administered online makes it difficult to really evaluate their skills. That’s because the school only has one computer lab, and that lab is dedicated almost exclusively to online testing. When Sturkey’s students come into the lab for testing, they spend most of their time trying to figure out how to use a mouse, she said. The lack of computer time also affects older kids in the school, including those in grades 3-8 who take the high-stakes exams that state officials use to determine which schools should be closed for poor performance. The state exams require older kids to write short essays but Robeson students struggle with using a keyboard, Robinson said.. The Detroit district has some of the lowest-performing schools in Michigan. Just a fraction of students in grades 3-8 — 4.1 percent — were reading and doing math at grade level last year. Paul Robeson Malcolm X claims to be the first public school program in the United States to provide an African-centered curriculum. Moore puts the blame for the district’s current lack of resources squarely on intervention by the state of Michigan. She graduated in 1998. The following year, state lawmakers led by then-Gov. John Engler, a Republican, removed the elected school board and replaced it with a seven-person reform board, appointed largely by the mayor, that ran the schools for six years. A decade later, another governor, Jennifer Granholm, a Democrat, named the first of a series of emergency managers who ran the district — and presided over skyrocketing debt and plunging enrollment. Last year, state lawmakers created a plan to address the district’s crippling debt by forming the Detroit Public Schools Community District, a new debt-free district that replaced the the Detroit Public Schools. A newly elected school board took over the new district in January. It chose Vitti in April, hiring him away from the 130,000-student Duval County Public Schools in Jacksonville, Florida. 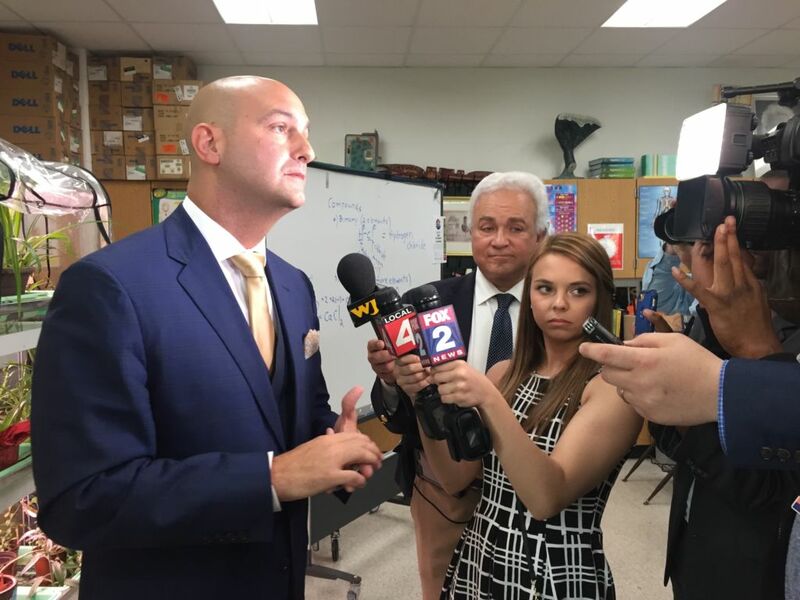 At an event last week, Vitti told a gathering of business and political leaders that he recognizes that Detroit teachers have experienced “trauma” from the “chaos” of recent events. Vitti has vowed to address the teacher shortage and to do what he can to raise teacher pay. During his job interview, he boasted of expanding music and arts in Florida. He talked of better technology for schools and says he’s listening to teachers and administrators. The parents and educators at Robeson remain skeptical. They know that despite the district’s status as a new, debt-free entity, it still faces severe financial constraints. But they’re hopeful that some things, somehow, will change — and that students in the district will someday have the same opportunities as their peers across the state and nation. "...A teaching shortage has prevented the school from hiring for non-academic classes such as music, art and gym..."
It astounds me that the author chooses to disrespect these college majors, the professors who prepare teachers-in-training, the department of education that certifies teachers in these subject areas, the local professionals that teach these subjects to our students, and most importantly the students who aspire to careers in, and their parents who want the general benefits of music, art, and gym to our children's whole-student development. Like it or not the prospects for a kid who can read, write and solve math problems are a lot better than one who can only draw a pretty picture or play a recorder! But don't get me wrong they're great hobbies. Your ignorance of education and how students learn is astounding. Yes and you teachers have done so well with all your theories over the last 5 decades! And what is your "theory", tie every child to their desks and feed them interminable math and reading lessons geared to standardized tests? Learning isn't drudgery, or at least it shouldn't be. Art and music stimulate the brain. It's absurd that I should even have to make this point. Art, music and fitness programs are critical for children. I remember my art classes at grade school in Trenton as a respite from learning academics. They were taught in a breezy light filled art room that seemed like a sanctuary, and I learned not only artistic techniques, but also about art--how else would I know about "Pointillism"? However, as long as No Child Left Behind and other mandated testing systems exist, the arts and fitness will suffer, be shunted aside or will be deleted from curriculums. Americans as a whole must care about the whole person when it comes to poor children. It is a civic duty to see that children are exposed to all that is decent, uplifting and inspirational. Why aren't we doing that? Because so many Americans today are crabbed, spiteful and limited themselves. All they care about is making money, and all they care about education is to see that it prepares the young person for some drudgery as soon as they leave school. I do not think the author meant disrespect by saying art, music, and gym are non-academic fields. This could be a categorization used by the school system to describe the "out of classroom" teachers. As a former teacher, that is how they are categorized by the school district, not by the author. So where is the money going in the "new" debt-free schools? How many leaders and principals still have their hands in the pot skimming dollars for new houses and Cadillacs while these children are warehoused without access to academic resources? YES!!! Where are the philanthropists? Why not buy school computers and supplies, invest in the future taxpayers, help them become productive adults, instead of donating to art museums. I do enjoy the arts, but it is more important to educate our youth and help them become employed adults instead of handicapping them to become disabled and a draw on the social security system. The district does not seems any better off than in 1995 which was my first year teaching in Detroit. The first grade classes in my school had average of 65 children in a class. At those numbers very little teaching was done. It was mostly crowd control. Just to fit all the kids in they had two long rows of tables the length of the room. Beginning pay was $28,000. Considering that is over 20 years ago, starting pay has not gone up that much. I remember my first day. I had no pencils, paper, crayons or any text books. It was not uncommon for new teachers to show up for a day or maybe a week and then quit. You really needed to be committed and willing to put up with a great deal. Interesting that there were 74 comments on Union related issue and 4 comments on article showing what it is like today in a real school. Until legislators and the public care about what goes on for students in these poor, mostly minority schools, nothing will get better. The article said that particular school currently has two teaching positions that are unfilled. So those two positions teach music, art and gym? I find that hard to believe. Workbooks could have been printed from the electronic version of the text book. Frankly, with the internet there is no need for textbooks any more. The problem is the education profession is not tech savvy, yet teachers are entrusted to prepare our children for INDUSTRY 4.0 which is robotic, big data, cloud computing base. Your comment highlights your ignorance on the matter. Just print them? What if you don't have a working printer or ink in your school? Or paper? Yes that is the reality in cash-strapped schools and districts. Your comment is so far out of touch with reality that it's almost comical. Use your over inflated salary to buy ink. What does the state give for each child in any district? Why is the money pissed away? Privatize every school and let the kids learn. Get them out of government schools. Tell the unions go pound sand. If Michigan would accept reciprocity with other state teacher certification, that may help solve part of the shortage. As a 28 teaching veteran from Georgia, with certification in 3 states , NTE and Praxis, Michigan put me through hoops to do what I always wanted to-teach. I finally gave up-why make it so difficult when you need teachers? Sounds just like my teaching days in Milwaukee! Packed classes and kids stuck in all day, and then in winter, add indoor recess to the mix because kids didn't have winter clothing to play in the cold. When I started teaching, we had art, music, and gym. When I left, one school had none and my last year I went to a school that had gym ONCE every other week for 30 minutes-whoopee!